Country number fifteen for our trip was Macedonia – or the Former Yugoslavian Republic of Macedonia. One of the first things I learnt was that even the name of the country causes controversy. Macedonia is also a region in Greece, and they lay claim to the name. This means that as a blogger, which ever name I use is probably going to upset someone. I acknowledge both sides of the story, but I am gong to call it just Macedonia, simply for brevity only. We arrived on the bus from Sofia to Skopje. 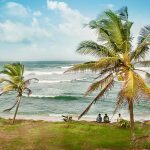 A new country, a new language, a new currency – and no clue how we were going to get to our accomodation. It’s not like we didn’t try to find out, but the information regarding Skopje’s public transport on the internet seems limited at best. We did work it out eventually (see my blog post here on what we found out), but it was almost getting to the point of tears and tantrums. Our air-conditioned room was a welcome relief, and apart from a walk to the local supermarket for supplies, we were done for the night. 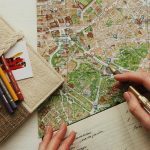 The next morning we started exploring the city the same way we seem to be starting a lot lately – with a free city tour! It began right outside Mother Teresa’s house. As it turns out, this is not her actual house, but rather a Memorial House. Which kind of made sense, because I always thought Mother Teresa was from Albania. This though, was both wrong, and right! 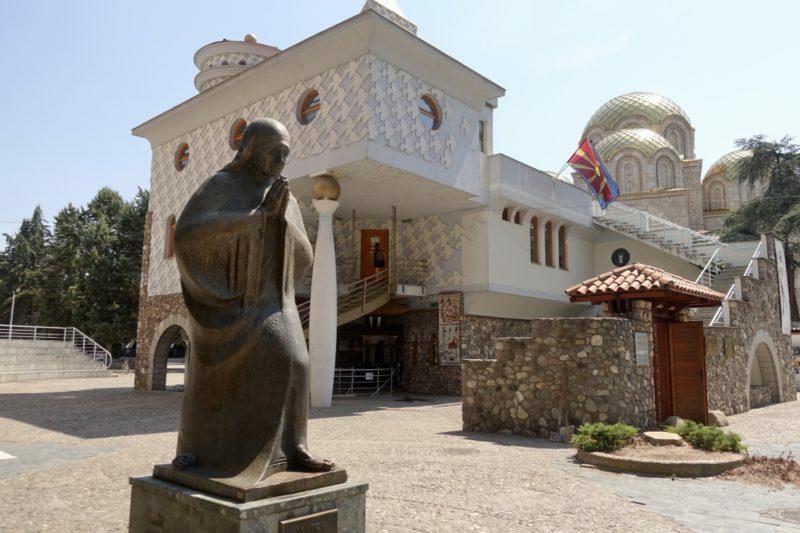 The house Mother Teresa lived in as a child was in Skopje. It no longer exists thanks to the earthquake in Skopje in 1963, but where it was located is marked out on the ground next to the main square with a commemorative plaque. But yes, Mother Teresa was Albanian. At the very least she was ethnically Albanian. Thanks to a very complicated history, at the time of Mother Teresa’s birth in 1910 the Albanian borders were, well, for want of a better word, fuzzy. Skopje may or may not have been in Albania, depending on who you asked. Today’s borders were drawn up in 1912 and there are still many residents of Macedonia who identify as Albanian. 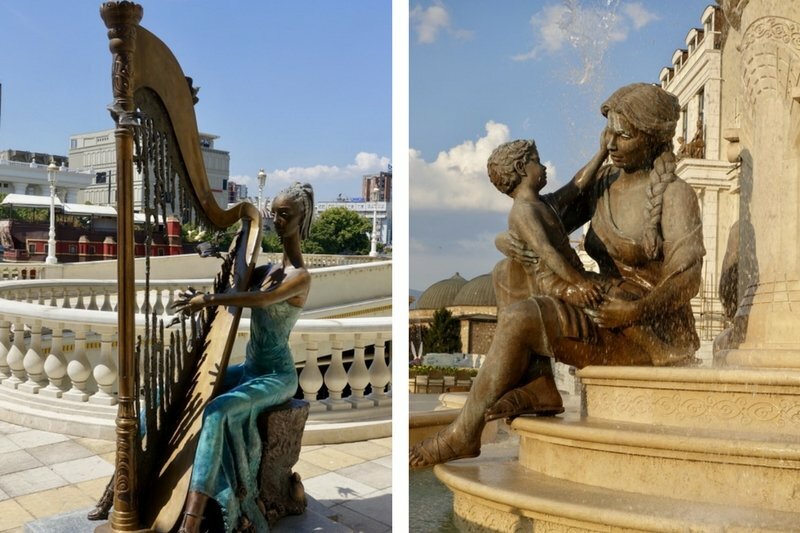 As we walked around Skopje, we couldn’t help but notice all of the crazy statues! Seriously, we couldn’t walk ten metres without coming across one. There were many that were of famous historical people, and others that, well, were of all sorts of random things! 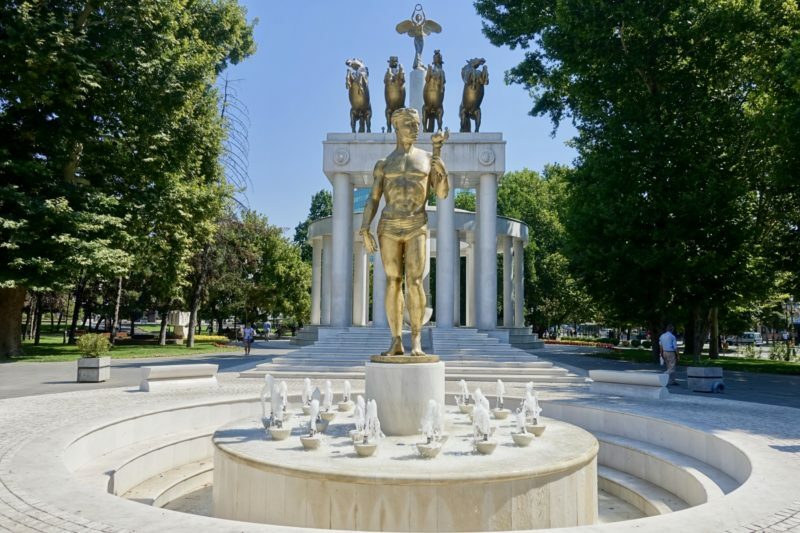 The biggest one – seriously, it’s huge – is of Alexander the Great in the main square. Although it’s not called that, it’s officially “Warrior on a Horse” because as part of the dispute with Greece, both countries claim Alexander the Great as theirs. Currently this is the biggest statue of him in the world, but Greece is building a bigger one. 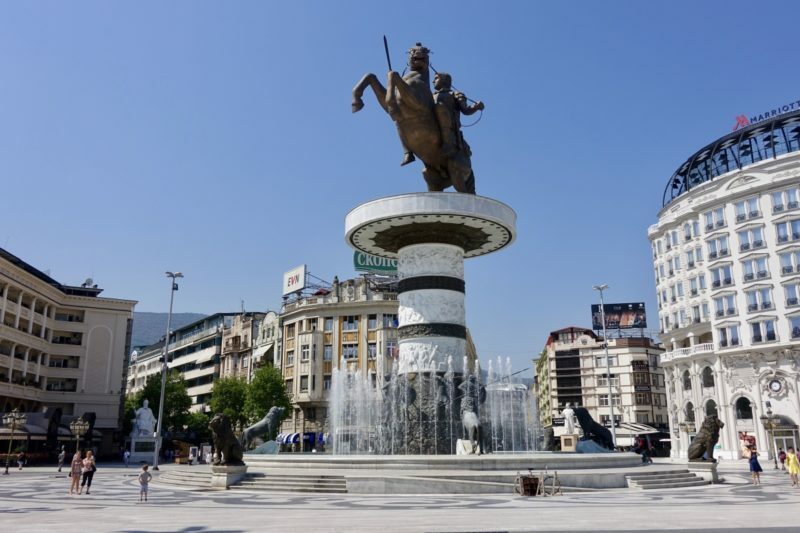 Speculation is that once it is completed, Macedonia will just try to outdo it again. 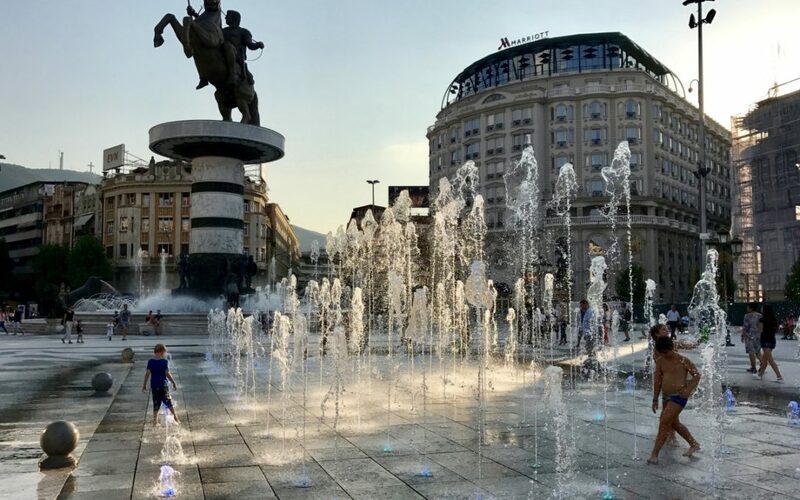 According to our guide, the people of Macedonia are not overly thrilled with all this building of statues and fountains, when those millions would be better spent on schools and hospitals. Some of the other statues are just plain strange. Many are the result of what our guide called “copy and paste syndrome”. 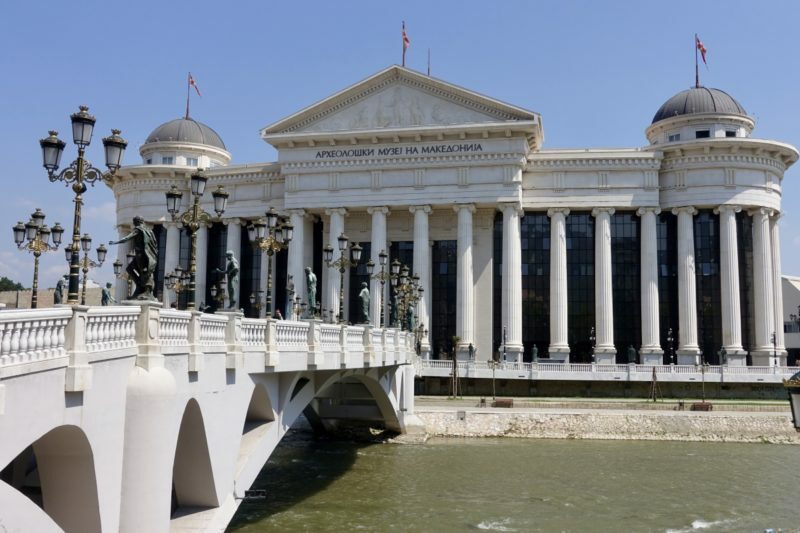 Someone in the government has travelled, seen something they liked, and then built an exact replica in Skopje. There is, for example, a charging bull. You know, like the ones that are built in financial districts of some of the world’s most influential cities. In Skopje it has been placed randomly outside a shoe store! There is also a triumphal arch, a smaller version of the Arc de Triumph, built, well, just because! Other oddities include the creepy looking musician playing a broken harp, the breastfeeding madonna fountain, and the beggar! These may not have a good story behind them, but they are fun to hunt down, and maybe that’s exactly the point! 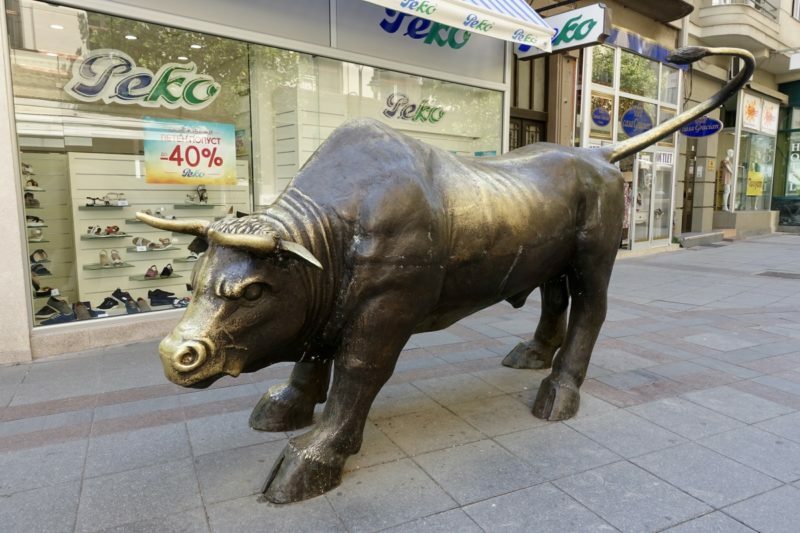 The charging bull of Wall Street…er, the shoe shop! Madonna and child fountain – with four statues on it. Like all good European cities, Skopje has a castle on a hill! It’s still an active archeology site, so a good portion of it is still being excavated. It is mostly good for looking at the views over the city. The entrance to the castle is through the Old Bazaar area of the city. This is on the other side of the river to the main square. You have an option of about four different bridges to get over there (and they are building another one!) The most famous bridge is the old stone bridge. The others are new, and, of course, are adorned with statues. The walking tour ending in the Old Bazaar with a rakia for everyone who wanted it, and soft drink for the rest. Some of us settled in to have lunch, chatting happily as we waited to order. We then had a bit of excitement as a drunk tourist (yes, it was barely barely past midday!) decided to throw his beer mug through the glass door! No harm was done, but we moved to a nearby place and tried some of the recommended local food. 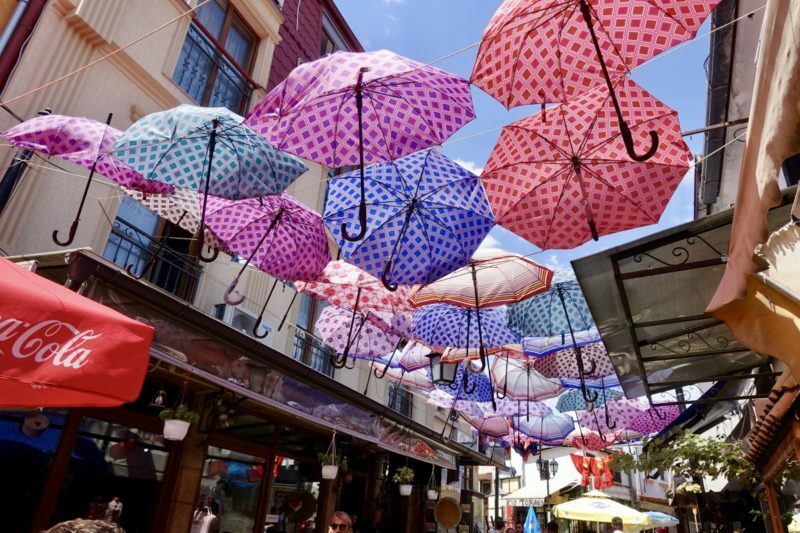 Another city with an umbrella canopy. I had a chicken roll, which is basically a piece of chicken, beaten with a mallet to thin it out. It’s covered by cheese and rolled up before being cooked. The same is also available in pork. We also tried what we were told was just called “cheese bread”. It ended up being bread cut into cubes with cheese grated on it. Admittedly it was tasty, but I was surprised to see how simple it was. Both the rolled meat and the bread used the local cheese, simply called “white cheese” on most menus. It’s like a feta, and oh so delicious! I think we had it with almost every meal, especially once we discover Shopska Salad. 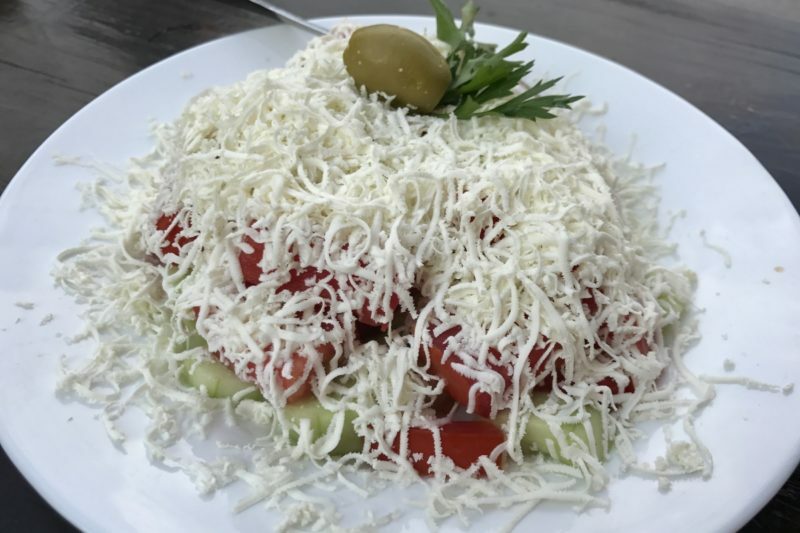 This simplest of salads is tomato, cucumber, onion, finely grated cheese and an olive or two. Not much to it, but it became my new favourite thanks to the cheese. 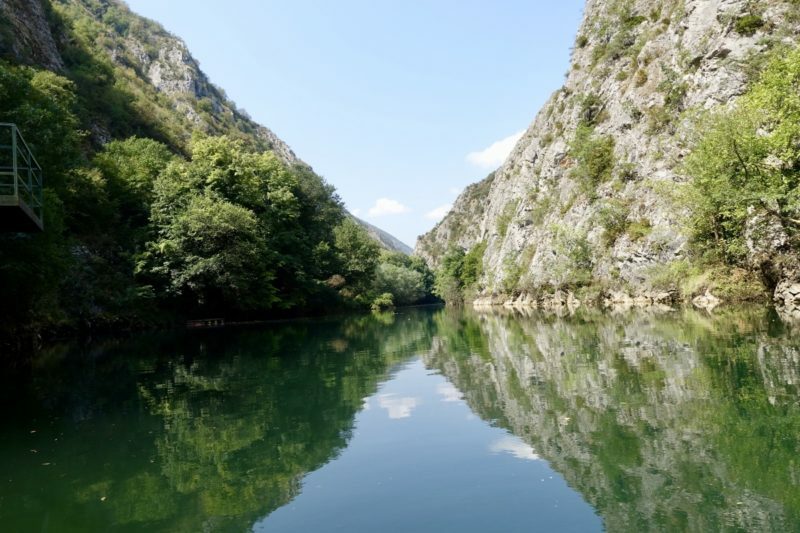 Possibly the number one thing to do in Skopje is visit Matka Canyon. We had heard that it was best to get out there early, by ten o’clock at the latest, before the crowds build up. There are many day tours that run to the canyon, but we decided to take the pubic bus. The bus details were again a bit vague, so we got to the bus stop early and were pleasantly surprised when it turned up on time. The fare was 75MKD and we were on the bus for around half an hour. 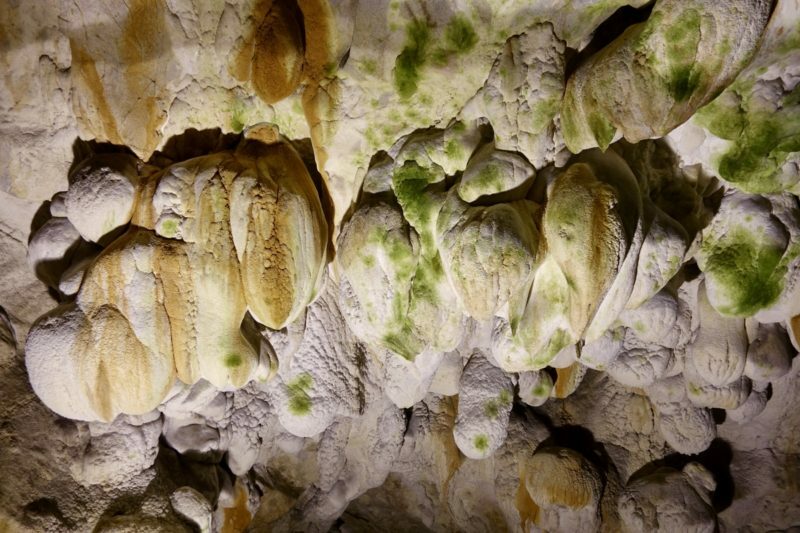 The very last stop is the one you want for Matka Canyon. You get dropped off outside a cafe next a stream. There don’t seem to be any signs showing the way. Just keep walking straight up the road in the direction the bus was going when it stopped. As you walk you will come to a fenced area with a building in it, go up the road to the right. It’s about a five to ten minute walk from where the bus drops you until you come to an area where there are kayaks and boats for hire. We decided to go for a boat ride up the canyon, with a visit to the cave included. The sign announced that it would cost 400MKD (about $10AUD) and the boat ride would take one hour each way. This wasn’t entirely accurate as it ended up being only around 90 minutes in total, but that was enough anyway. The canyon itself is like a little oasis. It’s peaceful and serene. The cave is small but okay for a quick look. The whole area is also good for hiking, and there is a path right along side of the canyon. We saw a few people walking along enjoying the scenery. 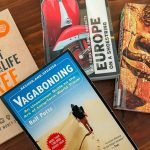 While I think a visit to Matka Canyon is worthwhile, there is one thing I just have to mention, if for no other reason than to prepare others. I was really disappointed to see the amount of rubbish laying around as we walked from the bus stop. We were there in the peak tourist season so it was busy, but this was clearly an ongoing issue with rubbish overflowing from all the bins and piled all along the roadside. For an area known for it’s natural beauty, this was a notable eyesore. I really wished I had a plastic bag with me and I would have picked some of it up. In the evening we went back to the Old Bazaar for dinner, searching out a craft beer place that had been playing good music when we had passed it on the walking tour. We grabbed some drinks and our standard order or kebabs and shopska salad, and enjoyed the balmy evening. Hilariously we had come here hoping to hear some popular rock music, Simon’s favourite genre, but instead we sat through a whole Taylor Swift album. After Matka Canyon, the next thing to do in Skopje is to visit the Millennium Cross. 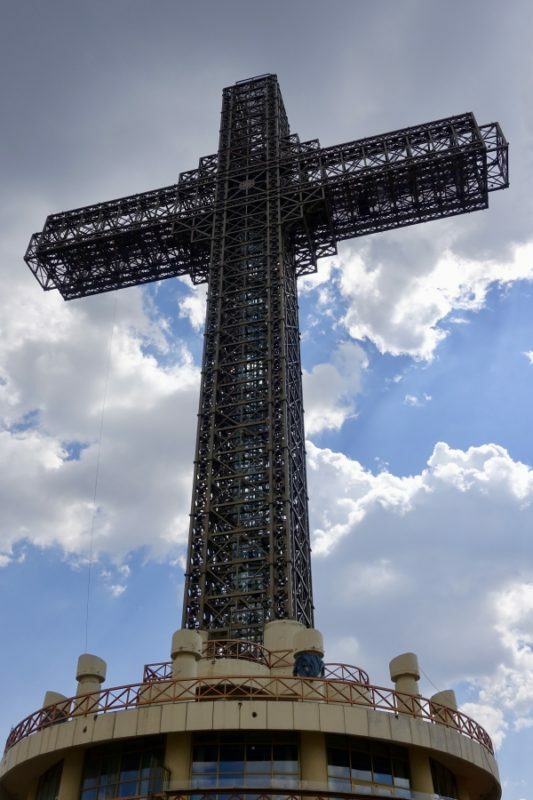 This is the largest cross in the world. It is twice as tall as the famous Christ the Redeemer which towers over Rio do Janeiro in Brazil, and sits at the top of Vodno mountain. At night it lights up and can been seen all over Skopje. The most popular way to visit the cross is to go up via the cable car. 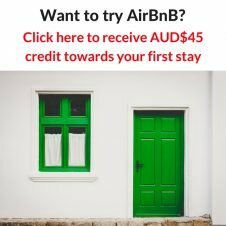 This can be done as part of a tour, or it is possible to catch a public bus up to the cable car for about $1AUD each way. The cable car itself cost 100MKD (About $2.50AUD) for the return trip. When we arrived at the cable car stop, we noticed it was not running for half an hour each hour, and we had to wait about ten minutes before it started up again. I am not sure if this was a regular occurrence as we hadn’t heard anything about it until we got there. At the top there is a cafe to grab a drink or snack, and a playground for the kids. There is also a larger playground and a picnic area a little further away. The best part is of course the view over the city and also in the opposite direction on the other side of the hill. Those alone are worth the small price to come up here for a look. Much of our time was spent exploring the rest of the city by foot. I was endlessly fascinated with searching out the strange statues around the place. We had a couple of things that we went to go and do but they didn’t come off. 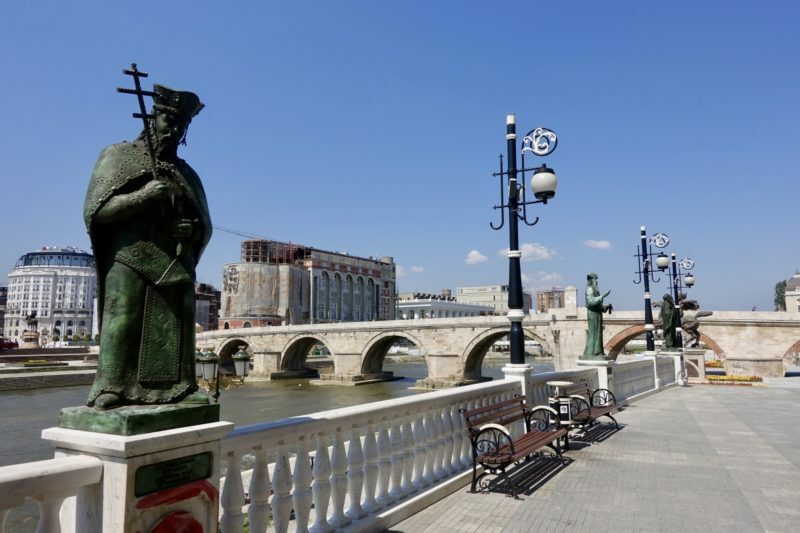 Skopje has some beautiful bridges and buildings like these. The old Stone Bridge. About the only thing not covered in statues – yet! We planned to visit the Museum of Macedonia but when we arrived the doors were open but the security guards waved us away. What the issue was we didn’t find out as their English was limited and our Macedonian was not up to the job either. We had been told at our accommodation that the ethnological part of the museum is worth a look to see all of the tribal costumes worn in the country. Our second aborted activity was a relief for me! The night before we had gone to an area just outside the city centre for dinner, again recommended by the host at our accommodation. 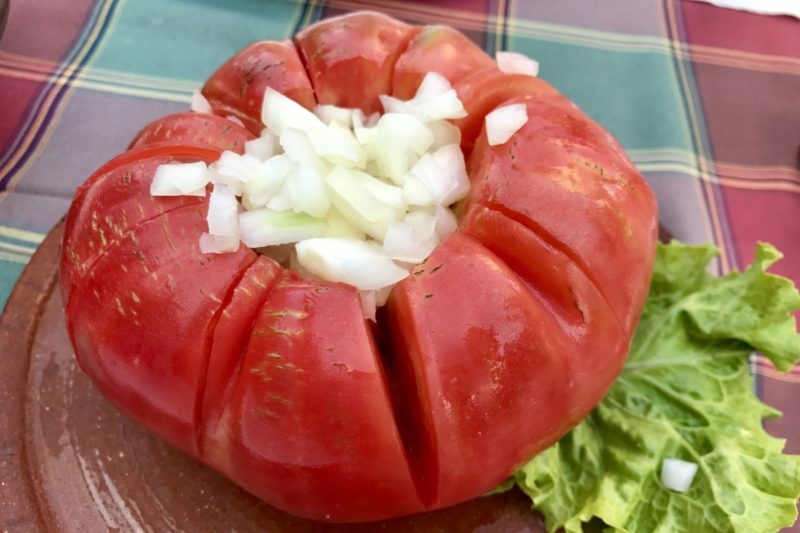 We tried a new local salad at dinner – a whole giant tomato with onion and some sort of dressing on it. The tomatoes need to be eaten within two days of being picked or they loose their flavour, and they are best for only a few weeks of the year. I have to say this was one really tasty tomato! After dinner we went for a walk, and came across a big park. On the other side of the park was the football stadium. This lead to discussion – by Simon – of which games were on, and in a moment’s weakness I agreed to go if there was a game on the next day. Not sure of the local name, our host just said to ask for the “Big Tomato” and they would know what we wanted. 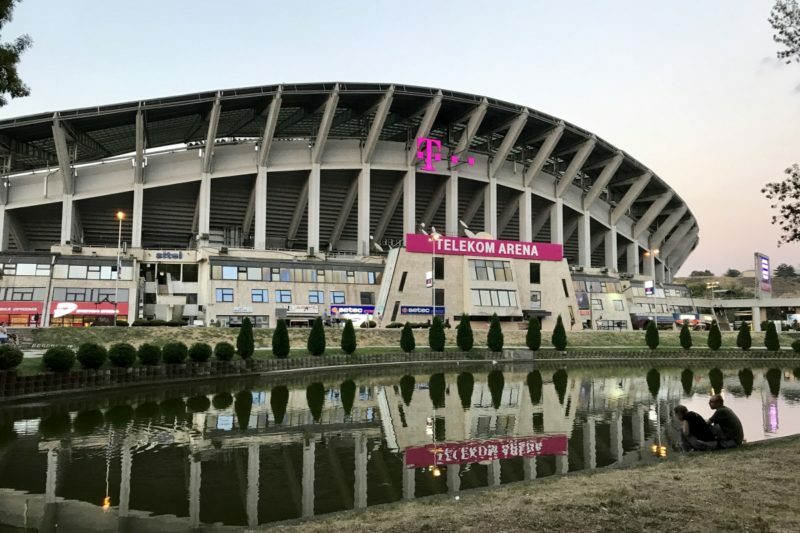 The internet told us there was a local game the next day so at the appropriate time we made our way to the stadium. But there was no one at all around. It didn’t look like there was a game on. Since I am not a fan of football (at least not the soccer version, Aussie Rules is my code of choice) I was cheering inside at this, and happily suggested we go get an early dinner instead. We are still not sure what happened, because checking later, the game was played. Maybe it was at another venue. 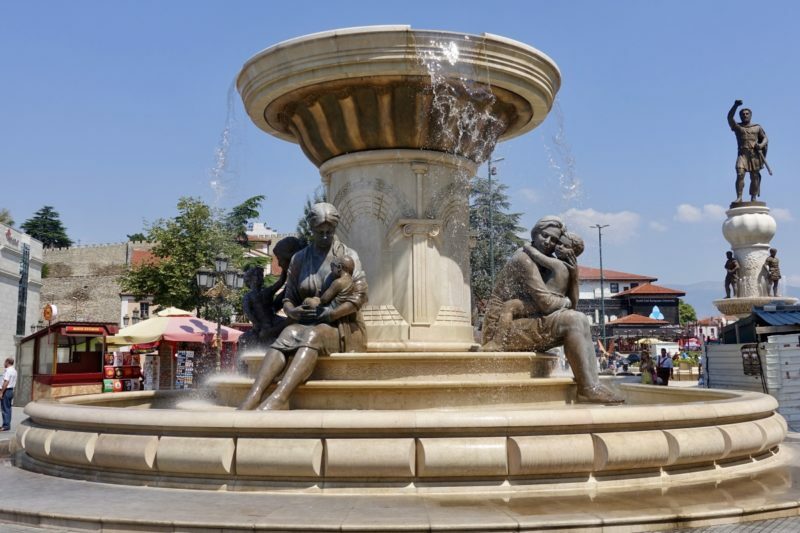 For more information on catching public transport in Skopje, including getting to Matka Canyon or the Millennium Cross, see my post on it here. The morning of our bus trip to Ohrid the weather finally changed. It had gone from high thirties to below twenty degrees with rain threatening. We seem to be spending this holiday going from really hot one day, to raining the next. It was nice though to get the bus station without sweating – at least in the literal sense. As we were waiting at our bus stop for the local bus to the main bus station, a bus a little further up the road decided to do a u-turn. Due to roadworks it didn’t make it around though, and got stuck, blocking both lanes of traffic in the direction we wanted to go. If we had to walk it was going to be at least half an hour, and as the minutes ticked by I was dreading the possibility. Just before the critical time, the bus got itself free and traffic flowed again, but still no bus for us. We had just turned to start walking, and around the corner came the bus! Yay. It was once of those moments where the bus seemed to be surrounded by a halo and a heavenly choir sings as it approached! 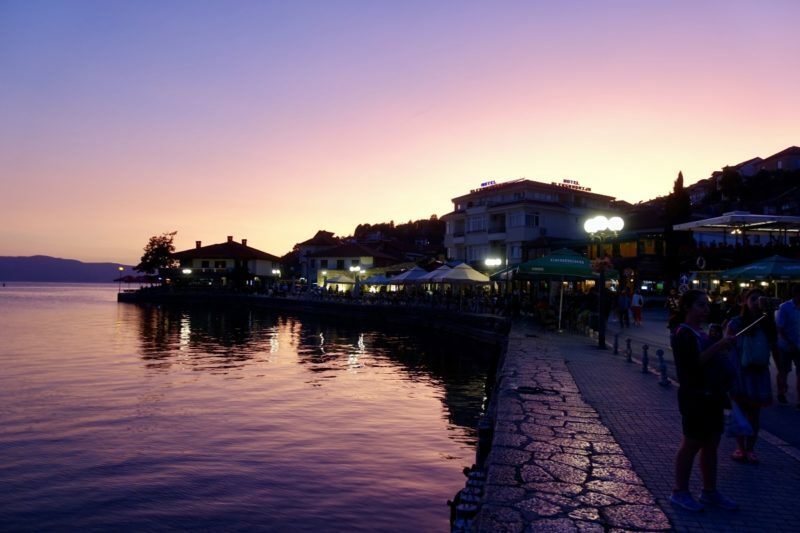 Ohrid is a town situated on the banks of Lake Ohrid. It’s a well know summer holiday destination, with lots of resorts. We were staying right in the heart of the town, only minutes walk from the lake front and the pier. During our first morning of exploration we walked along the lake front to the Potpes area. We had heard of Potpes, and as soon as we stumbled across the sign pointing to it in the old town I knew that’s where we were headed. We enjoyed a walk along the boardwalk, and then lunch in the restaurant. We could have pulled up a chair on one of the cute little beaches, but instead kept making our way around the coast. 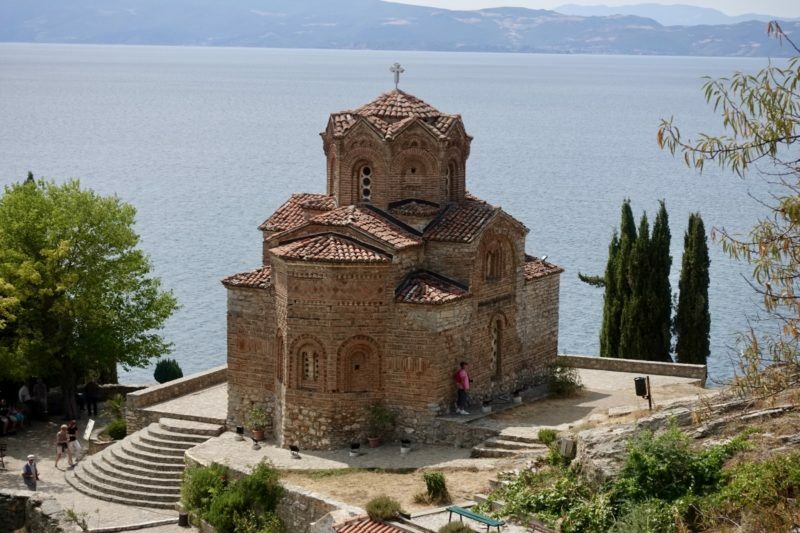 we were soon to discover that Ohrid has lots of churches in the old town. The first one we came to is the impressive Church of St John the Theologian. It sits high up on a ledge overlooking the lake. The views up here are worth the climb. The Church of St John the Theologian. Look at those views! We continued up the hill to eventually come to – another church! This one Saint Pantelejmon (also called Plaoshnik). It is right next to some ruins that are still currently being excavated. Also right next to it is a building site. 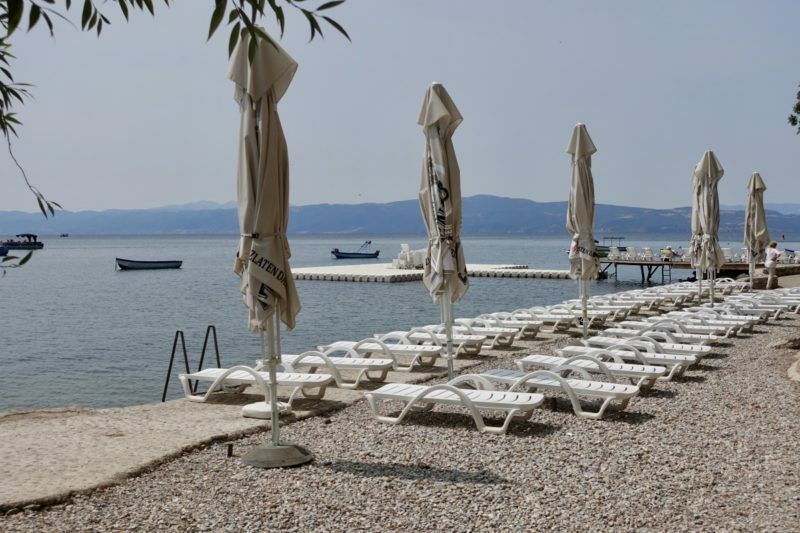 We thought we were looking at a new luxury hotel being built with amazing views out over Lake Ohrid, but we believe it may actually be a university campus. I am, of course, open to correction on this, as we were trying to read a sign written in Macedonian. We started our way back down the hill, passing by the Ancient Theatre on the way. 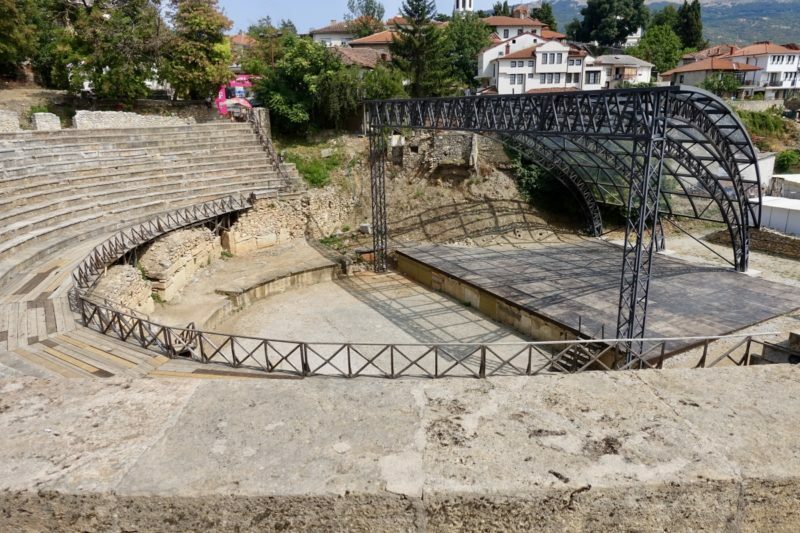 Clearly this is still used as a performance venue today as we saw a stage either being erected or dismantled. As we continued on we could see another interesting-looking church across the small valley, so planned to go in that direction. We clearly took a wrong turn and the winding streets took us right back down the the main restaurant strip. We contemplated climbing back up to the church, but the smell of coffee won out. There may have also been some gelato involved in our decision to call it a day. 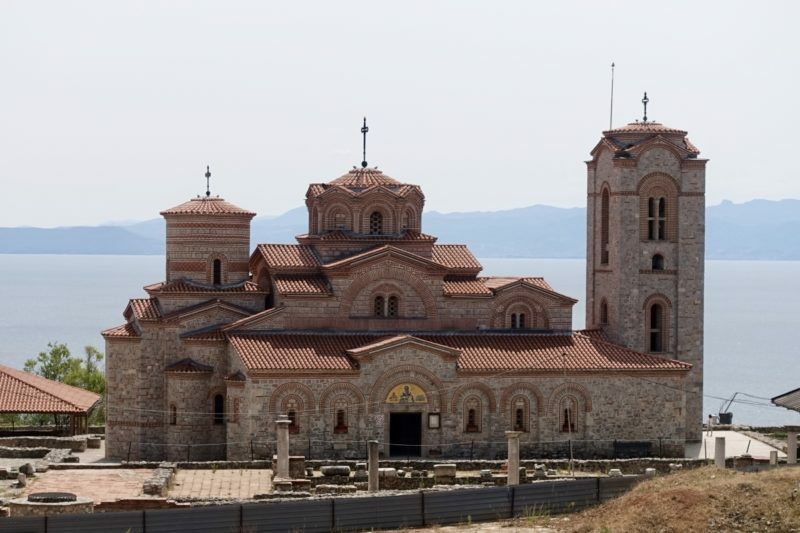 One of the most popular day trips from Ohrid is to visit the Monastery of St Naum. While it is possible to get a car or bus, for €10 the visit can be done by boat. The boat trip is about 90 minutes, and it was well worth the money for that alone. We were surprised to notice that many of the other people on the boat were dressed for swimming and had their beach things with them. Weren’t we visiting a monastery? Clearly I had not done my research, but while yes, there is a monastery, and a few other little churches, there is also a lovely beach area and a little creek area with perfectly clear spring water running out into the lake. While we did glance into the monastery, mostly we enjoyed the rest of the area. 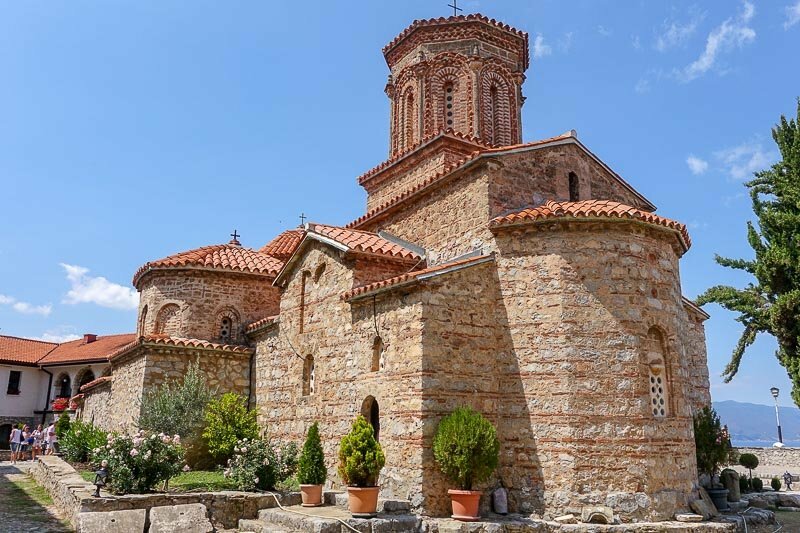 For more details on our day trip to the Monastery of St Naum’s, visit my full post here. 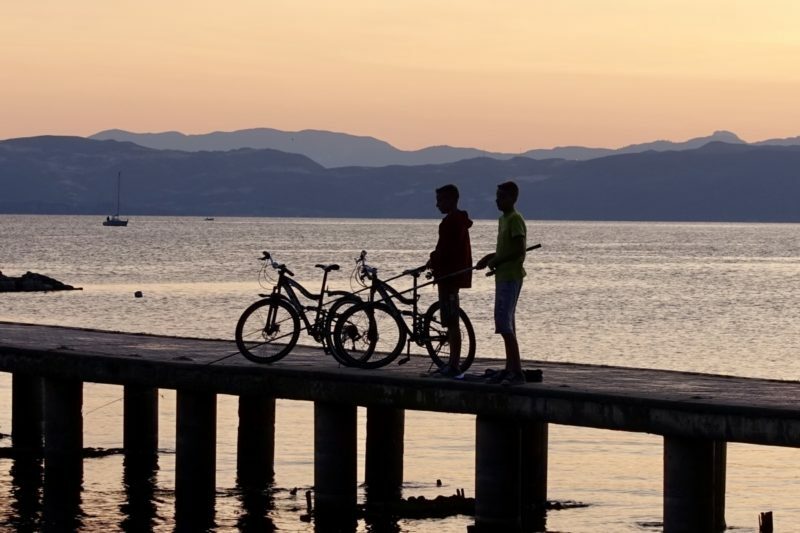 Nearly every evening while we were in Ohrid we watched the sunset over the lake. One night we were just strolling along the foreshore, another we joined the throngs of tourists wandering up and down the Main Street searching for a place to eat. On our last night we went up to Samuel’s Fortress for some fantastic sunset views over the lake. Unfortunately we had to leave a little before the sun actually set due to the 7pm closing time, but all in all it was still nice way to end our time in Macedonia – especially since we knew we had a 5am bus ride in the morning. Macedonia felt laid back and relaxing to us. While sometimes finding information can be difficult, once we were aware of that and went with the flow a bit more, all was okay. 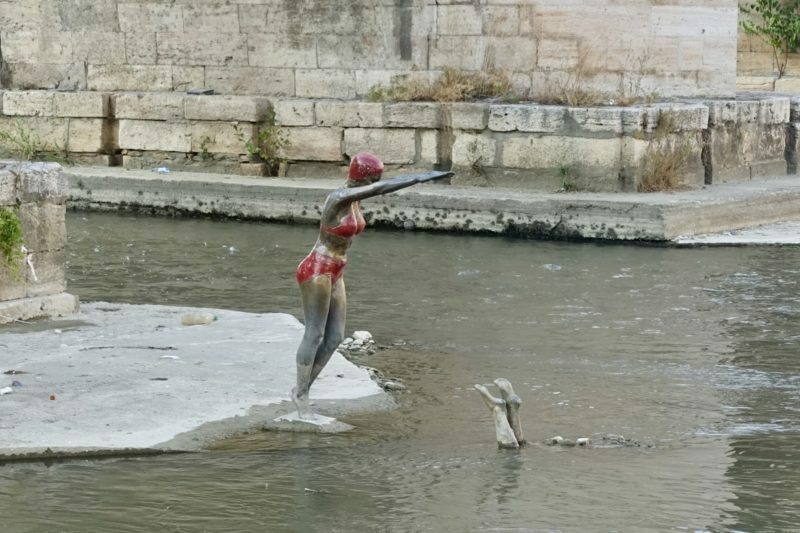 Skopje is the quirkiest city I can even imagine. I don’t know how many times we shock our head and wondered “why”. It was interesting, fun and inexpensive, and I would love to go back again in a few years to see a lot of the current building works completed. 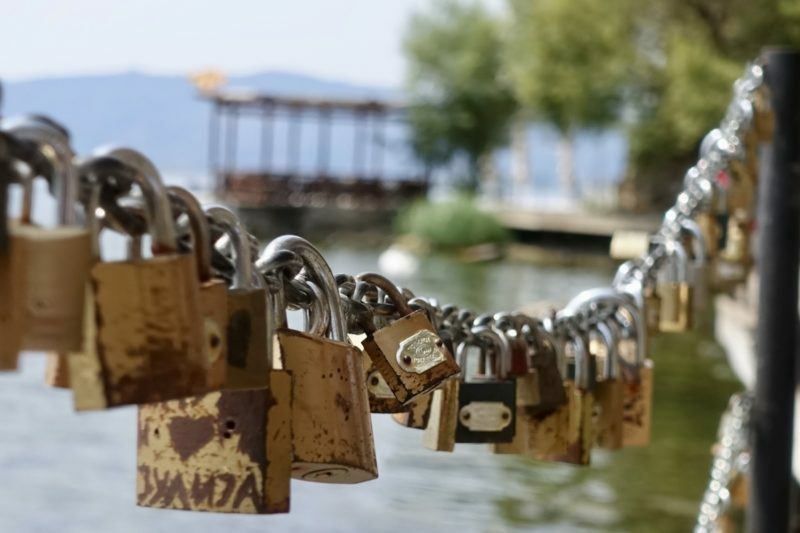 Ohrid we really enjoyed. I am starting to think my most natural state is to be around water. When I look back over my favourite places they always seem to be water-centric. That said, this was an interesting and relaxing place to visit. It was busy without being completely crowded. The nightlife is good too, if the club across the street from us was anything to go by. It was still dispersing customers in the early hours of the morning as we were heading to the bus. As I alluded to above, one thing the country really needs to work on is the environment. They have some lovely natural places that the amount of rubbish laying around really detracts from. 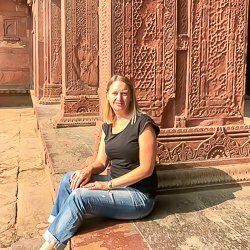 I’m not sure what made me feel it more keenly here that other places we have travelled, but it just seemed so at odds with so much else I think. Getting around Macedonia is a challenge, but once you work it out, the public transport seems to run smoothly and regularly. 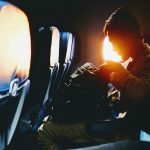 While I admit I cannot be called an expert after only a few days, I have written up another post with all that we did learn, and hope that others can use that as a starting point for their research. Prices are cheap! We could easily get a simple meal with beer and wine at restaurant for under $20AUD. Wifi was available at our accommodation and at most places we ate at. We also had wifi on the boat over to St Naum’s at Ohrid. There was no wifi at the main bus station in Skopje. Wow,this is really interesting! 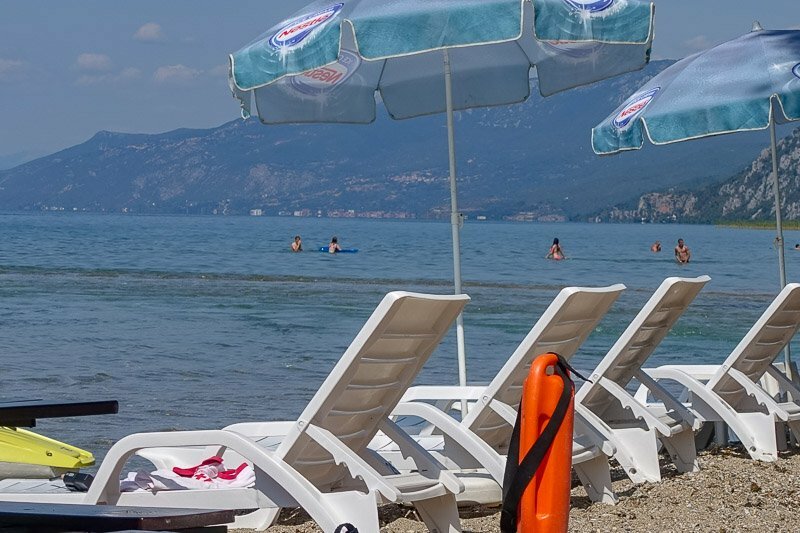 I live in Greece and recently traveled to Albania and Bulgaria, but haven’t made it to Macedonia yet. Thanks for sharing! Thanks Nina, Albania is next up on my list to blog about, we were there right after Macedonia. That was a great read! I’ve always wanted to see what it was like in Macedonia but it seems not too many people go there. Thank you for sharing! Thanks Constance. Most other tourists we met were young backpackers, mostly from Australia, UK and Europe. I didn’t see any tour groups or anything like that. Thanks Sarah. 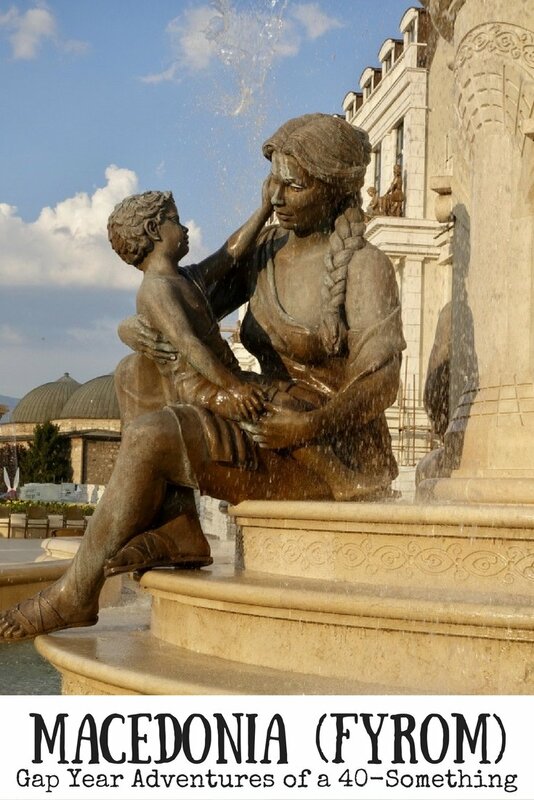 Skopje would definitely keep you busy looking at all their statues! I know the umbrellas and padlocks have been done A LOT but I still find them to be fun and quirky. Exactly! I just can’t help myself when I see them, I have to take yet another photo 🙂 Thanks Meg. 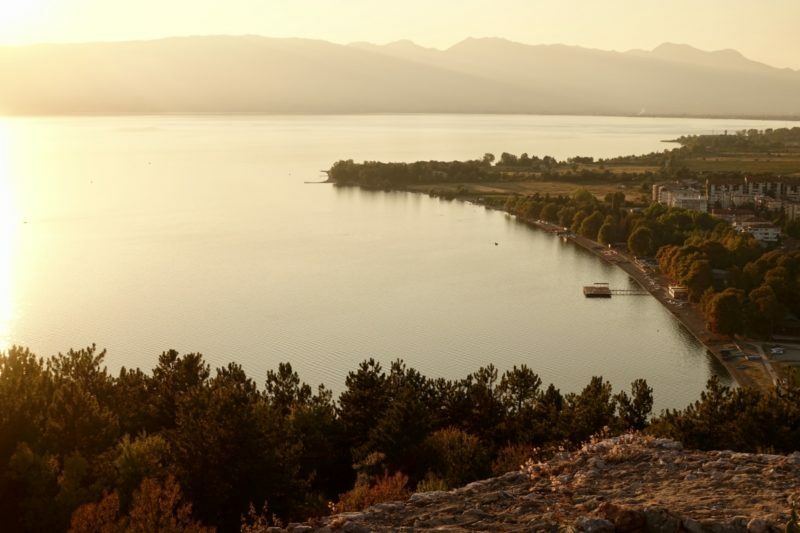 Wow Macedonia looks like such an interesting and off the beaten track destination! Thanks Laura. 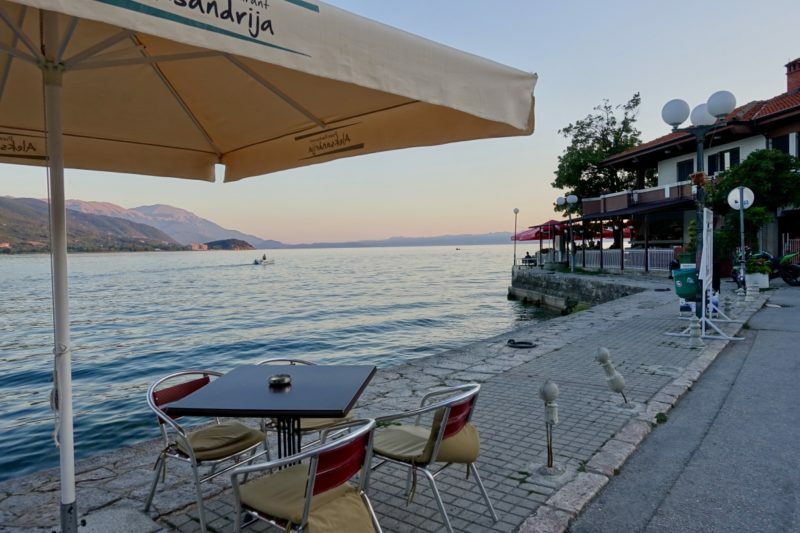 It’s not usually a first choice for travellers, but well worth a visit if you are in the Balkans. I have been toying with the idea of visiting Skopje for a while (all the ladies in my salon are from there and it sounded lovely). I never really knew what there was to do there. 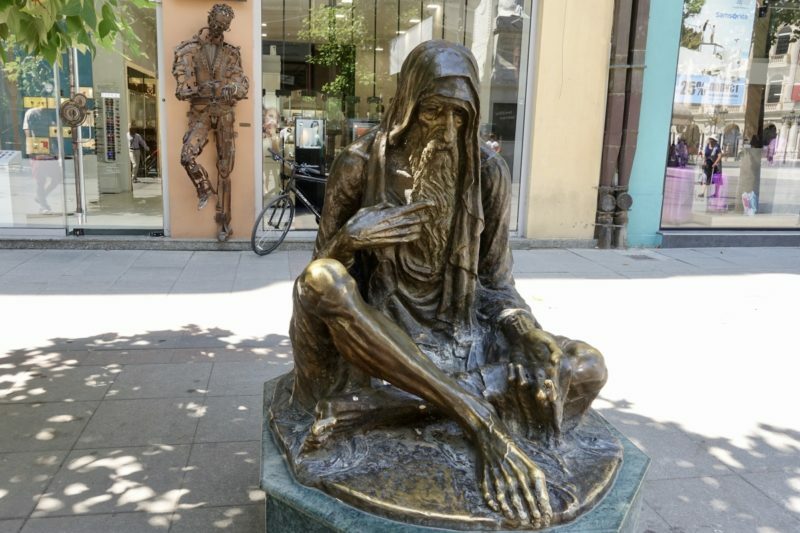 I am a big fan of hunting out weird statues and it sounds like Skopje is full of real gooduns! Yes, lots of weird statues! I could easily have added many more photos – but I had to leave some for visitors to discover for themselves! It certainly was nice getting out of the city. Oh wow, an unexpected destination but so beautiful! Definitely adding this to my list. Thanks Maninder. I hope to get a chance to visit one day. Macedonia looks fantastic! 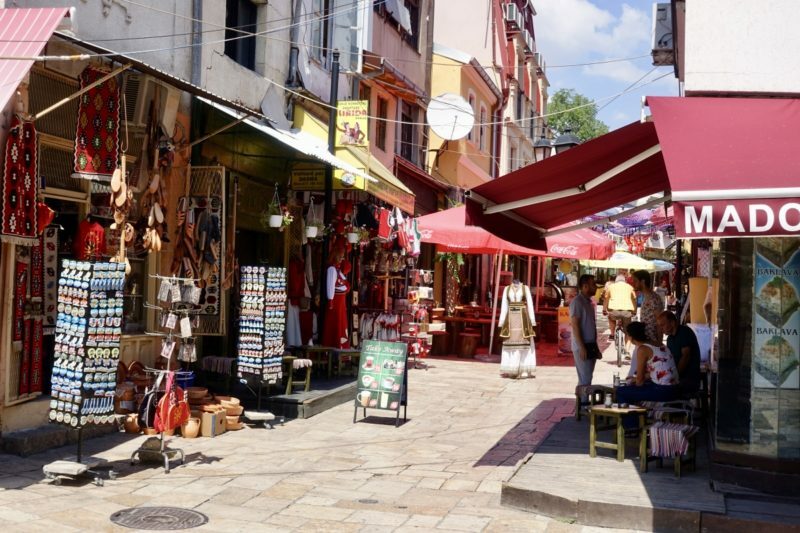 Skopje sounds like my kind of quirky city and those salads all look so amazing. 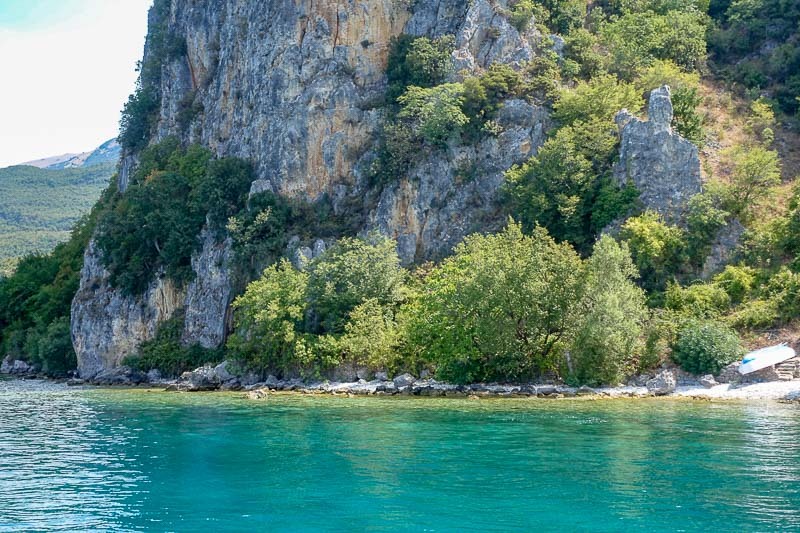 I am definitely adding Macedonia to my list because of your adventures. Thanks Candiss. I hope you get to enjoy the quirkiness yourself one day. 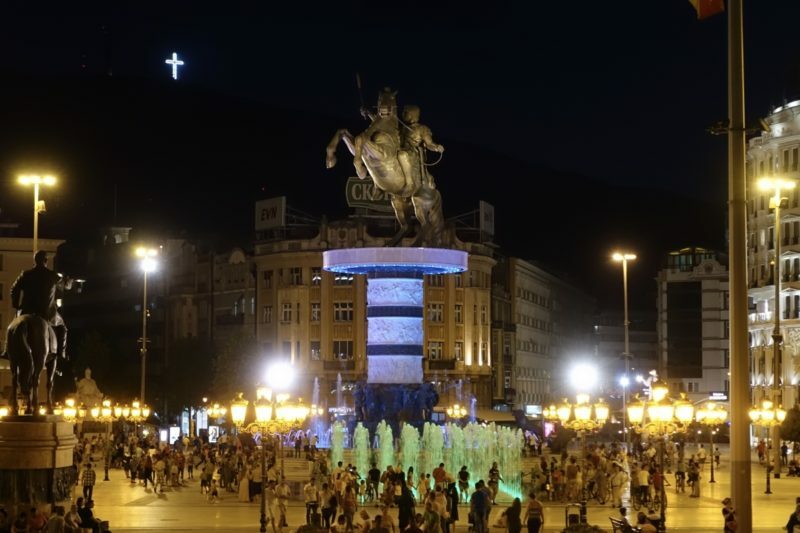 Macedonia looks like the quintessential european city to visit for sculptures and quirkiness. I love the scenery and would love to see the Matka canyon up close. Thanks Janine. Quirkiness and sculptures is definitely correct! A trip here can be done very cheaply. We stayed in mid range places, so it would definietly be possible to stay for even less. 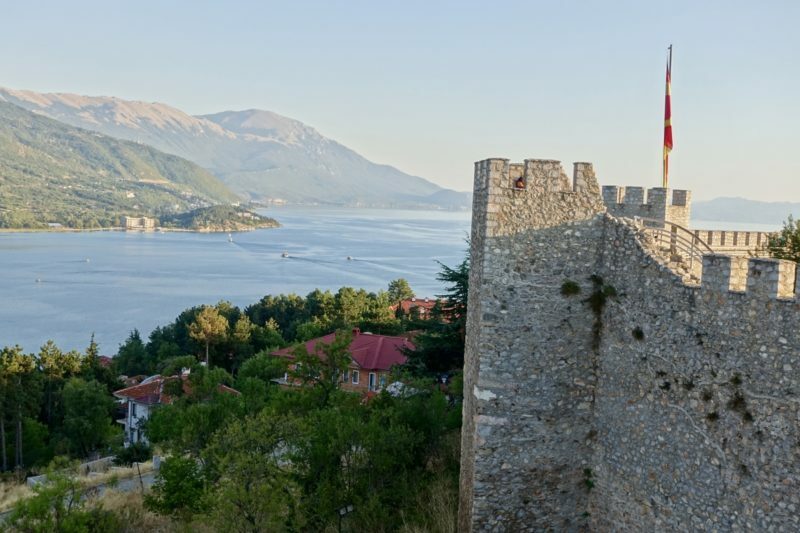 I have been looking for some informations about Macedonia to be a little prepared before my trip start this Saturday. Will you be going to Denmark too? Thank you very much and safe travels.